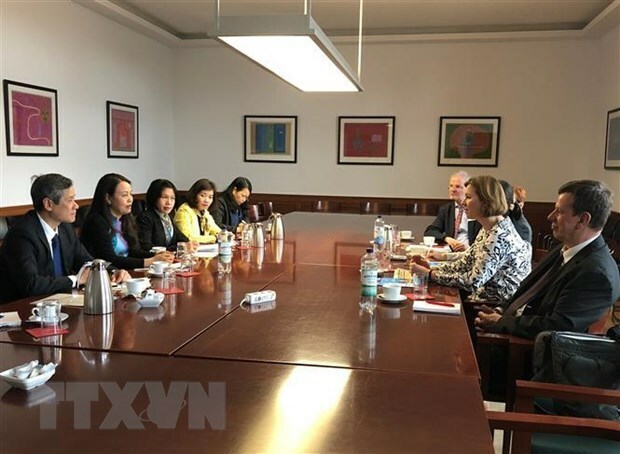 Berlin (VNA) – Chairwoman of the Vietnam Women’s Union (VWU) Nguyen Thi Thu Ha has expressed her hope for stronger cooperation with Germany in the areas regarding women and children, and women empowerment. Ha led a VWU delegation to visit Germany from March 26-28, during which she had working sessions with representatives of Ministry of Foreign Affairs, the Ministry of Economic Cooperation and Development (BMZ), the German Savings Bank Association (DSGV) and the Rosa Luxemburg Foundation (RLF). At these meetings, the official said Vietnam wants to cooperate with Germany in training and equipping women with necessary skills in the Fourth Industrial Revolution as well as capacity for climate change adaptation. She called on the German side to pay more attention to women affairs in collaboration with Vietnam, especially in building the action plan to implement the bilateral strategic partnership, and promote affiliation between women of the two countries. Ha talked about outcomes Vietnam has achieved in gender equality and women’s development, saying she was impressed by Germany’s performance in gender equality, particularly the rate of women participating in leadership and management in both public and private sectors. The official also appealed to Germany to support and promote the early ratification of the EU-Vietnam Free Trade Agreement (EVFTA), which is expected to bring about many job and development opportunities to women. Petra Sigmund from the German Ministry of Foreign Affairs lauded Vietnam’s achievements in economic development, poverty reduction and women empowerment. She said the ministry wants new initiatives to enhance and deepen the Vietnam-Germany strategic partnership during the building of the action plan, stressing that the ministry backs and promotes the ratification of the EVFTA. Claudia Warning from the BMZ said the VWU’s concern and proposals like a green innovative centre in Vietnam’s Mekong Delta match the ministry’s priorities in sustainable development. The BMZ supports cooperation with Vietnam, not only at the Government level but also in the form of the public-private partnership, and collaboration with civil organisations, with the long-term and effective affiliation between the VWU and the Sparkasse Stifftung as an example.